Experts estimate that predatory fish, the large fish that eat other fish, have declined by two-thirds in the last 100 years. By 2050, small fish could dominate the oceans because of the rapid decline of larger, predator fish. In a new report, the U.N. Food and Agriculture Organization finds that one-third of the world’s fisheries are overexploited, depleted or recovering and in urgent need of rebuilding. At a recent meeting of the American Association for the Advancement of Science meeting in Washington, University of British Columbia fisheries expert Villy Christensen predicted the eventual preponderance of small fish. Twenty years ago, Christensen designed a computer tool called Ecopath to study complex marine ecosystems. Now Ecopath has 6,000 users in 155 countries. Christensen used 200 marine models from the Ecopath database for the analysis released at the Washington meeting. "We are estimating that the predatory fish, the large fish that eat other fish, have declined by two-thirds in the 100 years and the decrease is accelerating. In the last 40 years alone, 54 percent of that decline occurred." 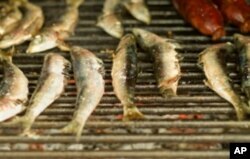 Over the same 100-year period, Christensen says, prey fish like anchovies, herring and sardines have more than doubled. "We’ve never had numbers like that before. We expected it might be the case, now we have numbers documenting it. What has happened here really is that we’ve changed the wild ocean. We’ve removed the big fish." More prey and fewer predators could throw the ecosystem out of balance, Christensen says. That could promote the growth of alga blooms which deplete oxygen in the water column. Christensen fears that marine animals and plants would then begin dying off in huge numbers. "If we look ahead we are going to see less stable ecosystems in the oceans. There would be forage fish and very few of the organisms that control our ecosystem. We need the predators to keep the populations healthy of all the prey fish. That will continue unless we change the way we manage the oceans." What’s driving these trends? Jacqueline Alder, coordinator of the Marine and Coastal Ecosystem Branch of the United Nations Environment Program, believes it is overfishing and pollution, complicated by global climate change. She says the future health of the ocean depends on fishing less, reducing wasteful by-catch, and taking action on multiple threats to marine ecosystems. "We need to think about expanding our marine protected area systems and also better management of those systems, reducing pollution, reducing the amount of nutrients coming in, including things like agricultural runoff." Alder adds that managers must consider restoring mangroves and coral reefs, "making it so those nursery ecosystems have fish that will grow up into adults that will be available for the fishing community in 2050." Eating more prey than predators could help restore a healthy balance to the ocean ecosystem. Fish now provide more than three billion people with at least 15 percent of their animal protein diet. According to the U.N. Food and Agriculture Organization, fish farms are set to overtake wild ocean catch as the primary source of food fish. Villy Christensen says the aquaculture industry currently relies on a variety of prey fish to feed its farm-raised species and that practice is not conducive to a healthy ocean. "Instead of fishing down the food web we have to eat down the food web. We need to eat the sardines and anchovies." Christensen suggests that by changing our eating habits - eating more prey than predators - we could help restore a more healthy balance to the ocean ecosystem.